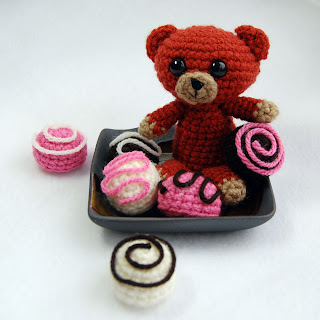 This year, instead of chocolates or flowers, I'm giving my Valentine sweeties amigurumi bon-bons, courtesy of this free Lion Brand pattern. These things are super quick to make up and the options for decorating them are literally limitless. Plus, when the real candy is simply empty wrappers and regret and the flowers are gone to the compost bin, my little bon-bons will still be there to say "I love you." Well, either that, or they'll be permanently added to my daughter's play food collection -- but if that isn't love then what is? I made my bon-bons a little differently from the instructions but for the most part, I remained true to the pattern. The pattern calls for a heavier yarn (Vanna's Choice), but I decided to go with a sport weight to make my finished bon-bons a little smaller. Of course, using the sport weight yarn also meant using a smaller hook (I used size E). I followed the pattern all the way up to round 6, where it says to stuff firmly. But, with the stuffing in I found it a little more difficult to do the round 7 decreases. So instead I completed round 7, stuffed, and then completed round 8. Not a huge change, but it did make things easier on me. To decorate my bon-bons, I used Aleene's Fast Grab. I have little to no patience for glue (I would rather sew something on), so you have to believe me when I say that Aleene's is good stuff. All in all, I made 18 bon-bons and the project took me about half a day (working on and off with the usual "mom interruptions." The bon-bons look good enough to eat and I can't wait to give mine as gifts. 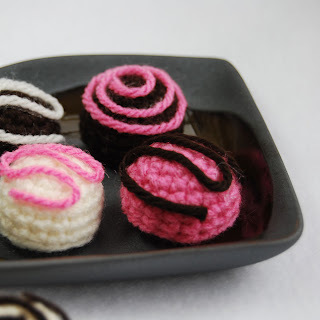 If you'd like to give a set of bon-bons but don't have time to crochet them yourself, I have listed 2 extra sets in my shop. Get them before they're gone!